" ΧΤΥΠΟΥΝ ΤΗΝ ΠΟΡΤΑ ΔΕΚΑΤΡΕΙΣ "
With a new documentary «13 Knocking at my door», comes to London the renowned journalist-director Athina Krikeli of New York, to approach the story in her own journalistic perspective: The before and after of the fatal explosion of July 11th 2011 at the Naval Base Evangelos Florakis of Cyprus. nearby, as well as the foundation of the entire country. The shooting process of the documentary lasted 3 months, while more than 35 interviews were performed so that the viewers would be able to follow the events before and after the explosion. The tragic aftermath of the explosion was: 13 dead and 62 wounded. This documentary film is an effort to document both the loss of 13 people and also the indifference of many others, before and after the tragic event. « It has been is the most difficult documentary film - states its creator Athina Krikeli - not only because of the nature of its subject, but because of the 'obstacles' that many had created for us. It was a difficult process on our part - a struggle of low profile and quick movements so we would not be caught in the tentacles of bureaucracy. Certainly out of the 30 documentaries I have created till today, this one affected me and branded me with pain: it had opened my eyes to an unpleasant side of Cyprus, while at the same time I met there some of the most wonderful Greeks»! The première of the film took place in Cyprus, at the Zena Palace theatre of Nicosia, on January 13th 2013. 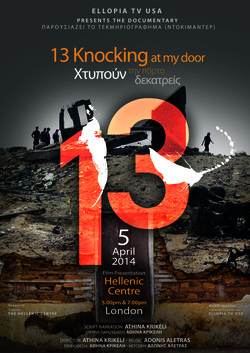 The date was chosen by Athina Krikeli herself in honour of the 13 victims. Many performances followed in all cities of Cyprus, as well as in the city of Thessaloniki Greece. MARI CYPRUS : 5th largest accidental explosion and 8th largest overall. The resulting explosion killed 13 people, 12 of them immediately, including Captain Andreas Ioannides, the Commander of the Navy (Cyprus's most senior naval officer), and the base commander, Lambros Lambrou. Also killed were four navy personnel and six firefighters, while a further 62 people were injured. The explosion severely damaged hundreds of nearby buildings including all of the buildings in Zygi the island's largest power station, responsible for supplying over half of Cyprus' electricity. As a result, much of Cyprus was without power in the immediate aftermath of the incident and rolling blackouts were initiated in order to conserve supplies. According to a list of the largest artificial non-nuclear explosions, the explosion was the 5th largest accidental explosion and 8th largest overall. In open storage on the base were 98 containers of explosives that had been seized by the United States Navy in 2009 after it intercepted a Cypriot-flagged, Russian owned vessel, the MV Monchegorsk travelling from Iran to Syria in the Red Sea. According to leaked US cables through WikiLeaks, released in 2011, the US through Hillary Clinton exerted pressure on Cyprus to confiscate the shipment. The ship was escorted to a Cypriot port and the Cyprus Navy was given responsibility for the explosives, which it moved to the Evangelos Florakis a month later. At the time of the incident in 2011, the explosives had apparently been left in the open for over two years. The Cypriot government had declined offers from Germany, the United Kingdom and the United States to remove or dispose of the material, having feared an adverse reaction from Syria. The government had instead requested that the UN effect the removal, but claimed that its request had been rejected. As a result of the damage to the power station, the electricity supply to approximately half of Cyprus was interrupted. The Electricity Authority of Cyprus later instituted rolling blackouts in order to conserve the supply and stated that it would import generators from Greece and Israel while the damage, estimated at €2 billion, was being repaired. The rolling blackouts lasted for two to three hours in each area and were planned to affect only residential areas. The electricity authority stated that "airports, hospitals, tourist areas and industrial estates will not be affected from the power cuts in an effort not to cause problems for our economy". The economic damage of the disaster has yet to be officially assessed by the Government, but of the 700 million euro facility, only a "mangled shell remained." The station's installed capacity was 47% of EAC's total and would have soon increased to 55% with the delivery of Unit 5. A private deal was signed on 16 July for the supply of up to 80MW from Northern Cyprus until the end of August. Funerals were held for the majority of the dead, including Ioannides, on 13 July. Some time after the explosion, speculation emerged that some of the substances in the containers may have been toxic. There were concerns for the health of those who were in the vicinity of the explosion, but the Cypriot Health Minister announced on 20 July that no public health risk had been detected, but residents would be kept under observation as a "precautionary measure"